I wrote a little bit about the Long Beach show last Thursday while the show was still early, but I’d be remiss if I didn’t comment a bit further this week. You may have read about this previously from others, but for those of you who have missed it, the February Long Beach show was one for the ages. No, it wasn’t due to the bourse activity (though it was fine), it wasn’t because we spent over a million dollars cumulatively (we did), but it was because of the outstanding exhibits that were on display. We mentioned the Ship of Gold exhibit in last week’s CWL, but I had the privilege to celebrate the unveiling of this second rendition of the Ship of Gold exhibit on Thursday night, and it was truly a privilege. I was able to have brief talks with Bob Evans, the conservator of the coins, as well as being able to speak with several of the numismatic leaders of the recovery, Larry Goldberg and Dwight Manley. This was a real treat, and I’m excited to see the rest of the results of this fantastic treasure-find. The other highlight was the Tyrant of the Thames Collection. On display was one of the most fantastic collections of ancient and British coins that is known to exist, outside of the Queen’s Royal Collection. Not only were the coins quite amazing, the actual display was the most elaborate and beautiful educational set-up that I have seen, even surpassing the Smithsonian’s exhibit. This was the first portion of the collection to be displayed over the next few years, but I would certainly encourage anyone to make a trip to Long Beach to view the future renditions of this collection. Overall, the show was surely a success and a treat to attend. Typically, I shy away from the cross-country trips, but with exhibits like this, it was certainly worth the excursion. Looking back at the action of the show, the sales were decent, and the public traffic was better than it has been in recent years. Our next outing is to the ANA Mid-Winter Show (National Money Show) in Irving, Texas. Gary and Mike will be in attendance for the week, and we hope to see some of our friends from Texas in attendance. As usual, if there’s anything that you’d like us to bring with us, please let us know this week via email at coins@davidlawrence.com. We’ll pack it up with the rest of our inventory and bring it along! Let us know when we can expect to visit with you there or we’ll look forward to seeing you in Baltimore just two weeks later! Why we love it: A scarce date to find in the Lincoln Cent series in gem condition with the red designation. The pretty, light magenta-toned obverse combined with stunning, flashy luster evident on both sides of the coin give this gem incredible eye appeal. Of the few surviving examples of this key S-Mint issue, this one is tied for the finest known in existence across all grading services. Value: he PCGS Price Guide has this coin valued at $26,500. With only two public auction appearances since 2013 ($44,000! and $17,625), we’ve reserved this coin for a very reasonable value of $21,500. It’s a fantastic value for a registry-set collector, and a piece that simply does not come across the block often. Why we love it: A beautiful gem example of this popular, scarce 20-Cent Piece type coin. This coin features lovely peripheral toning with stunning rainbow-colored highlights. The toning around the rim of the obverse and reverse are complemented by its bright white centers and evident luster giving this piece premium eye appeal. 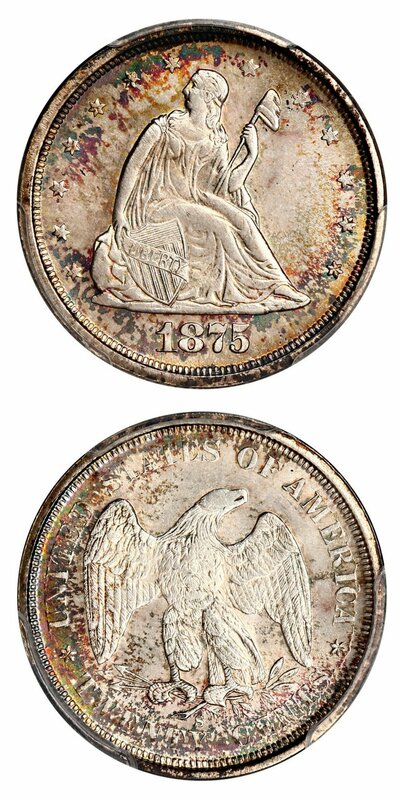 There are only five other examples of this 20-Cent Piece issue graded finer by PCGS. Value: The PCGS Price Guide has this coin valued at $7,500, and the CPG Value is listed as $8,120. It is available in this week’s auction with the reserve set at the amount of just $6,500. 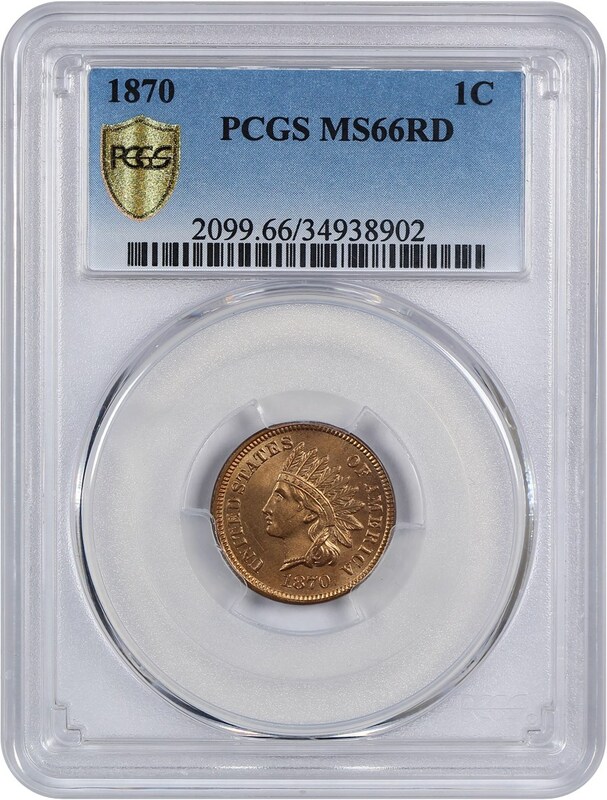 That is $1,000 under the PCGS Price Guide, and $1,620 below the CPG Value for this beautifully toned and desirable, scarce 20-Cent Piece gem type coin! Why we love it: This much better date Indian Cent features gorgeous, bronze-red colored surfaces that are nearly completely blemish-free. The eye appeal of this popular, scarce gem is outstanding with rich red coloring and large amounts of stunning luster. There is only one example graded finer (66+) than this attractive key issue across all grading services. Value: The PCGS Price Guide has this coin valued at $12,500 with recent auction records ranging from $9,400 for less attractive pieces to similarly-nice pieces at over $20,000! We’re happy to make this one available for just $10,750 via Make Offer! 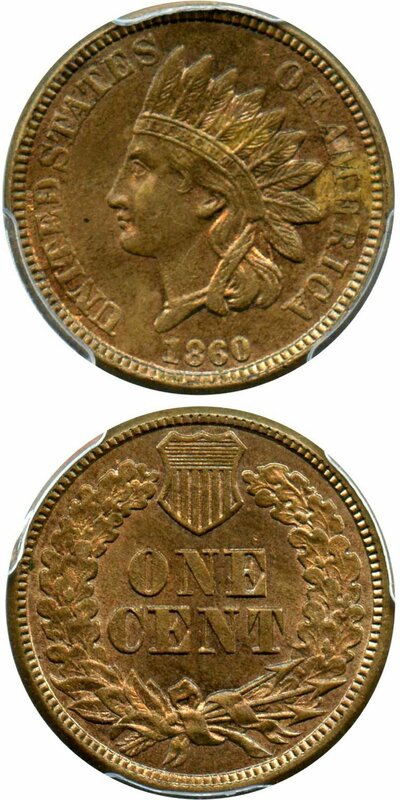 An excellent value for this registry-quality, scarce date Indian Cent! Why we love it: A popular and scarce, early Carson City Mint Issue Double Eagle with blazing luster and intriguing, rich golden coloring. This grade is surprisingly desirable for this issue as the eye appeal is uniquely beautiful, and there are none in existence graded finer than MS62 at PCGS with considerable price jumps between these few Mint State grades. This coin comes from a lower original mintage of just 138,441 coins struck, in which very few have survived. Value: This low mintage coin is valued at $14,500 by PCGS, with a CPG value of $11,800. 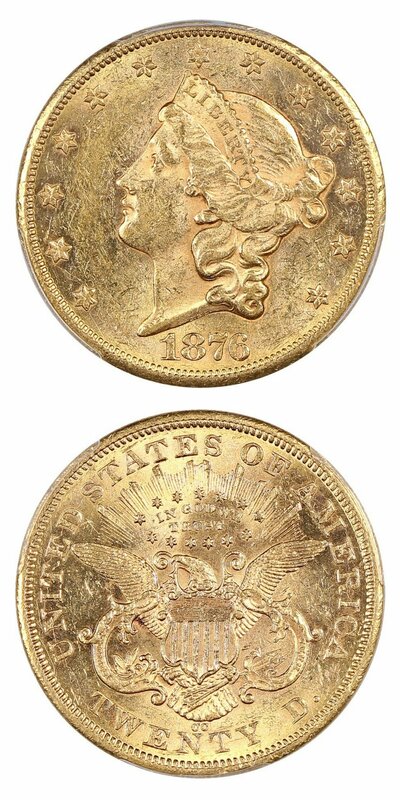 Available via Make Offer for just $11,000, that is a great value for this scarce, early CC-Mint Double Eagle with gorgeous, flashy luster! Why we love it:This scarce Charlotte Mint Issue Liberty Head Quarter Eagle displays flashy, lustrous surfaces and ideal yellow-gold coloring. The fantastic eye appeal and limited blemishes of this coin are the reason for its CAC approval and are a nice surprise given the assigned grade. This coin comes from a low original mintage of only 23,226 coins struck, in which there are only thirteen examples graded finer by PCGS. Value: The PCGS Price Guide has this coin valued at $10,000. It can be yours today for just $9,000 via Make Offer! That is $1,000 below the PCGS Price Guide value for this scarce, low mintage Liberty Head Quarter Eagle from the popular Charlotte Mint with CAC approval! Why we love it: A complete matching proof set from 1902 consisting of six beautiful gems, in which all but one is CAC approved. The specific grades for each coin are as follows: 1c Proof 67 Red, 5c Proof 65, 10c Proof 66, 25c Proof 67, 50c Proof 66, & $1 Proof 65. All the coins feature gorgeous toning except for the Indian Cent that features pristine blazing red surfaces. These stunning colors and surfaces make for high-quality eye appeal across every coin in this impressive, early proof set. The existence of a matching set of this date (and housed in older NGC Holders nonetheless!) is quite surprising as most sets from this period have been broken up over time. Value: he combined PCGS Price Guide value for this impressive, complete 1902 proof set is $23,275. This set is available in this week’s auction with the reserve set at $19,000. 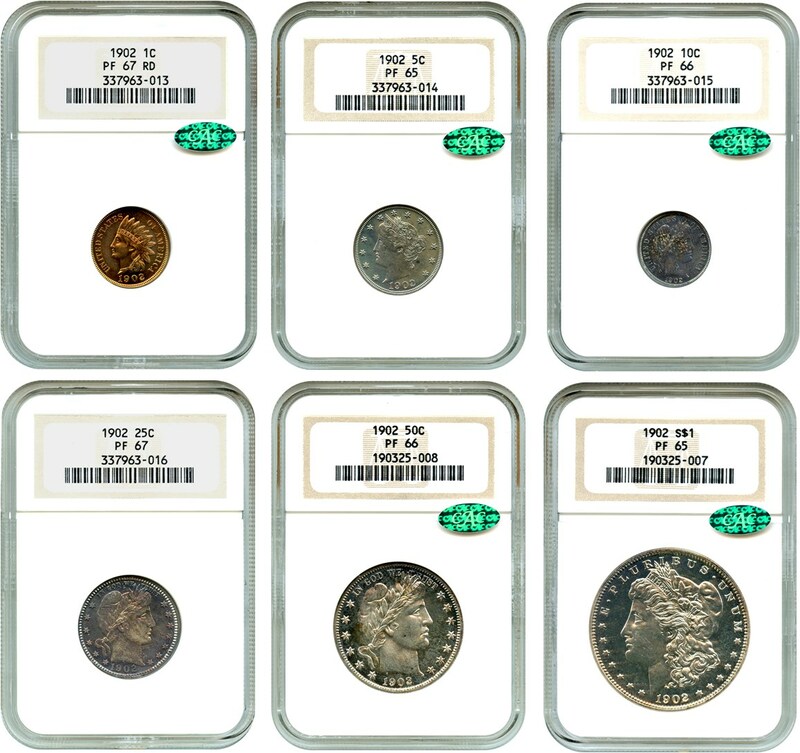 That is $4,275 below the PCGS Price Guide value for this fantastic set of coins! Individually, the parts of this set would likely sell for far more, but we view it as a numismatic crime to break up such a pristine offering, thus we’re hoping that a long-time collector will take advantage of this neat opportunity. Why we love it: This better date P-Mint Morgan Dollar, housed in an Old NGC Holder, displays gorgeous deep-mirrored fields and frosty devices along with rose-gold rim toning. This beautifully lustrous, original coin has high-quality eye appeal for the assigned grade with its pristine surfaces and extreme beauty. Value: The PCGS Price Guide has this coin valued at $425. It is available for purchase at the low price of just $340 through our Make Offer function. 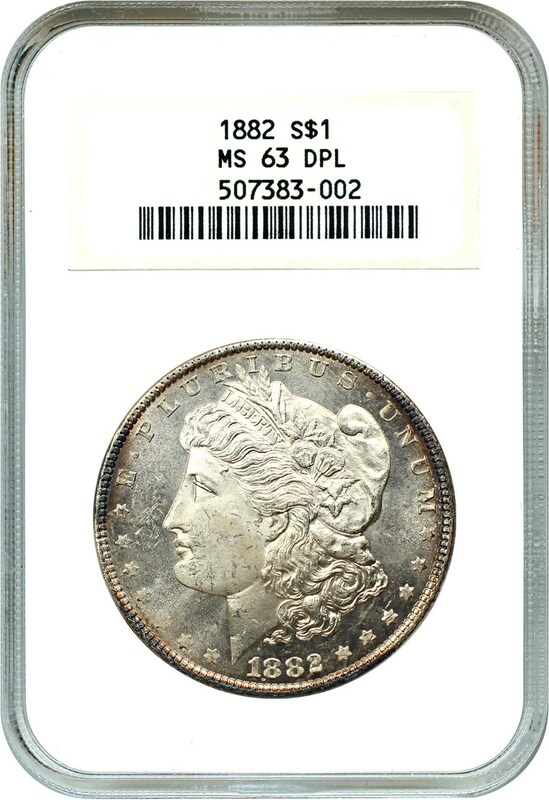 This is a great opportunity to own this better date Philadelphia Mint Morgan with gorgeous DMPL surfaces and pretty rim toning! Why we love it: An attractive, affordable example of this copper-nickel composition Indian Cent type coin. 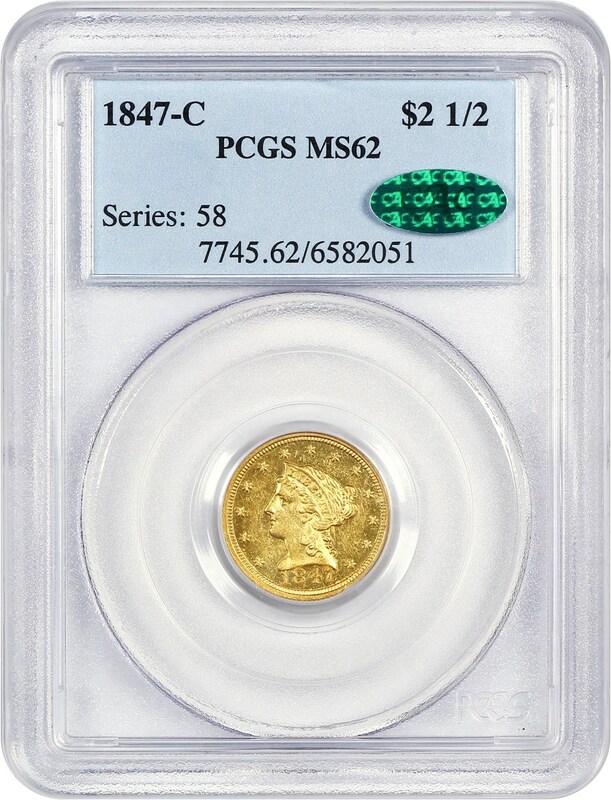 This coin features pretty, unique coloring along with lustrous surfaces and ideal eye appeal for the grade. 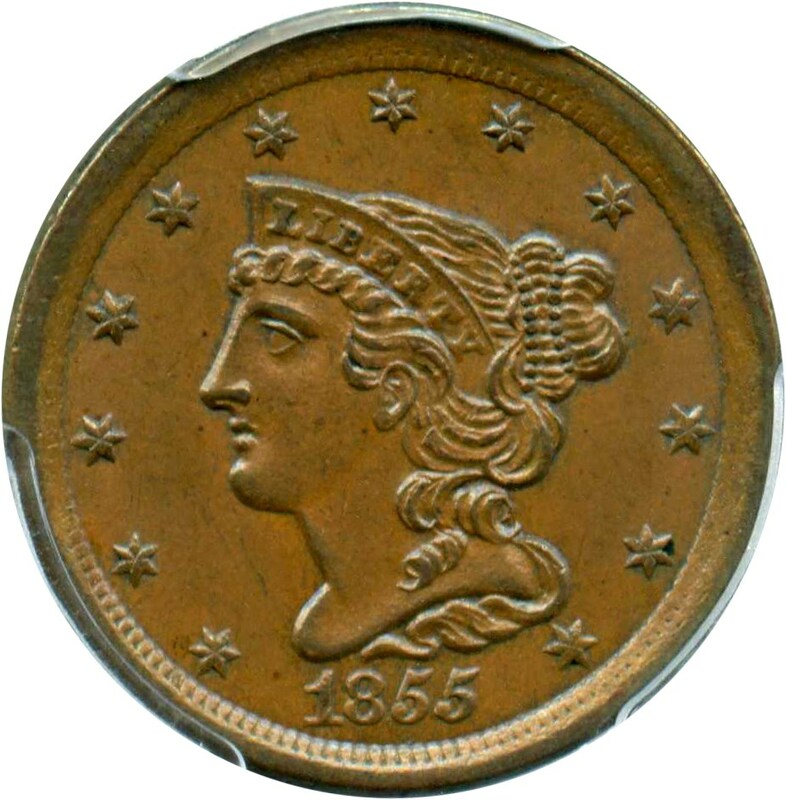 The obverse displays a mix of light and dark brown hues with some golden-brown highlights complemented nicely by an even, chocolate brown reverse. Value: Both the PCGS Price Guide and CPG Value have this coin valued at $325; however, it is available for just $300 via Make Offer! An excellent value for a popular early example of the Indian Cent! Why we love it: This stunning ultra-gem Full Step Jefferson Nickel displays immaculate, lustrous surfaces with pretty, subtle golden toning covering the coin. The near-perfect blemish-free fields, uninterrupted well-struck devices, flashy luster and pretty color give this coin incredible eye appeal. Value: The PCGS Price Guide has this coin valued at $600; however, we are offering it for $525 as part of our CWL special via Make Offer. 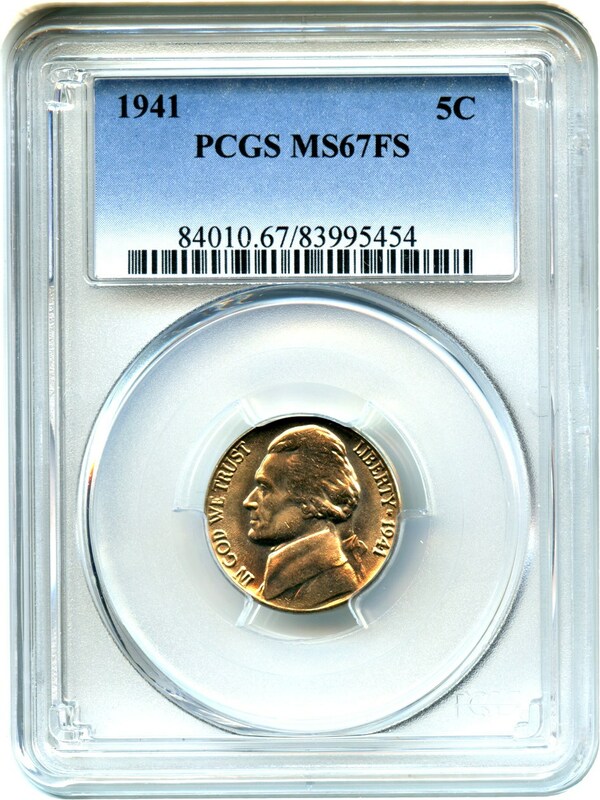 This is a neat opportunity to own an ultra-gem Full Step Jefferson Nickel at a good value! Why we love it: This attractive yet affordable near-gem type coin from the Braided Hair Half Cent series displays pristine surfaces that are nearly without any blemishes. This pretty, chocolate brown Half Cent features nice eye appeal with its uninterrupted, sharply detailed devices and clear, immaculate fields. Value: This piece is available via Make Offer for just $575, with the PCGS Price Guide value at $650. Now’s your chance to take this good-looking coin at a discounted price home today! 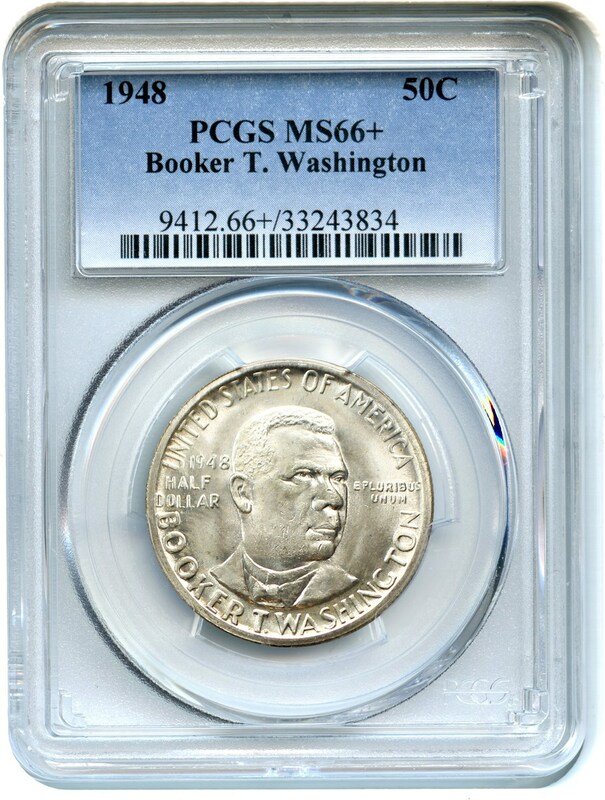 Why we love it: A blast white gem example of this low mintage commemorative issue that was minted to celebrate the life of Booker T. Washington. This coin displays fantastic eye appeal from its bright white, blemish-free surfaces and incredible luster. This piece comes from a low, original mintage of only 8,005 coins struck, and there are only ten other examples graded finer by PCGS. Value: The PCGS Price Guide has this coin valued at $400, but it is available for the price of $300 via Make Offer. That is $100 below the PCGS Price Guide value for this gorgeous, lustrous example of this low mintage commemorative issue! Auction # 1003 Live! Browse and Bid on Lots Today!